Your guide for mind, body and birth. Come on in, we’re glad you’re here! We are Los Angeles’ first accredited birthing center specializing in midwifery care for home births, birthing center births, & water birth. Our midwives will guide you every step of the way and our wellness practitioners support not only you but your whole family. Take a seat; nurture your intuition; fill yourself up with our healing touch. Take a moment to explore our full list of services and classes. Breathe easy because you have found the support you have been looking for. Welcome. Through curious conversation and storytelling, there is always something new to learn about how amazing we are as humans in body, mind, and spirit. BBJ is packed with practical advice and helpful tips. We will discuss not only the joys and triumphs, but we go there - towards the challenges to learn how they were navigated so you can learn how resilient and strong we are. We will talk with the pregnant person, their partner, the doula, midwives, OBs, and grandparents - anyone who was part of the birth! We will cover it all - pregnancy, childbirth and the postpartum period. At BBJ we welcome all perspectives and you will hear stories from all kinds of modern families. Join us to not only listen and be inspired but to feed your mind, open your heart and let your inner Birth Junkie out! 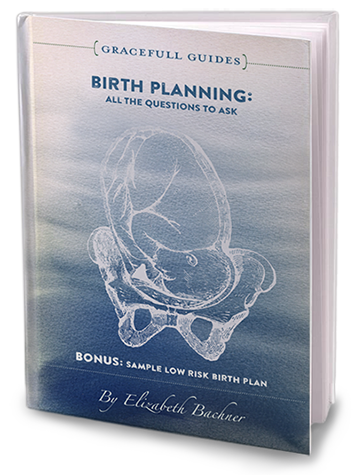 Birth Planning: All the Questions to Ask is a comprehensive guide to creating your own birth plan, written by GraceFull Founder/Owner Elizabeth Bachner. The guide simplifies the many overwhelming aspects of preparing for childbirth through GraceFull's embodied and self-driven approach. We at GraceFull believe that your journey begins with the relationships you establish with your care providers and support team. Our eBook provides all parents-to-be with a toolkit of facts, vocabulary, and real-life anecdotes that will ensure you are seen and heard as you navigate options to craft your unique birth story with confidence.